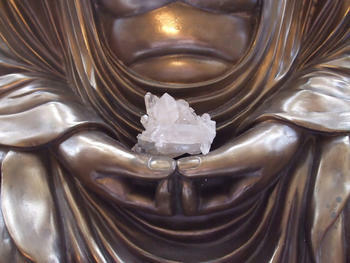 Meditation has been practised for thousands of years in cultures of both the East and the West. Originally the exclusive domain of the religious practitioner, meditation is fast finding increasing relevance and application within our contemporary culture amongst all members of society. This is particularly the case with the 2,500-year-old traditional Buddhist meditation that enables the development of a calm-mindful-awareness. Once viewed as an Eastern art, practised within the religious/spiritual context of a Buddhist monastery in the service of realising Enlightenment, the practice and potentials of mindfulness based meditation are finding a much wider interest and expression. What makes this particular meditation form so approachable and applicable, beyond its original context is the universal quality of mindfulness. Mindfulness is the clarity of conscious awareness that connects us to our direct experience of life, free from the habitual ‘reacting, resisting, denying, and distracting’ that often occurs. Engaging mindfulness reduces general life stress, and the acute stress responses of ‘fight, fright, or flight’. This helps us to enable greater physical health, healing, and wellness; mental calm, clarity, and creativity; emotional responsiveness, ease, and joy, while also fulfilling our full human potential. Meditation practice is important for the exercising and development of Mindfulness, whilst also offering a conscious break from the business of the ‘doing’ mental mode to a quality presence of the ‘being’ mode. However it is the application and use of mindfulness in our ongoing day-to-day life and experience that is essential. Mindfulness can thus be applied in our daily life, helping us to consciously respond from a clarity of awareness, and presence, a ‘fullness of mind’ (mindfulness) in attending to our ongoing experience. It is here that mindfulness ,enhances the quality of our relationship to our ongoing experience, and thus enhances the quality, appreciation, and expression of our life. Consciousness, enabled by deep calm-clarity and deep insightful-understanding. What underlines and embraces the primary motivations for practicing meditation, as well as enabling change and transformation, is the development and enhancement of a mindful-awareness. A mindful-awareness enables a quiet depth and spaciousness from which to view and experience more fully the content of our consciousness, the constant flow of mind/heart experience (phenomena). Mindful-awareness helps us to re-perspect our thoughts, issues, ideas, and entanglements that previously appeared looming and overwhelming. To appreciate the dynamics at play that cause our stress and distress, disappointment and despairing; to have insight and develop understanding and freedom from such entanglements. Here we can begin to see and experience the content of the mind, as discernible from the context of the mind, the natural stillness, spaciousness, and silence of the mind apparent between the thoughts, ideas, and mental images. This inner ‘Stillness ~ Silence ~ Spaciousness’ of mind enabled by a mindful-awareness, is the natural state of our mind uncluttered from the flow of mental chatter, images, ideas, and constant commentary. When we become too removed from the inner true nature of the mind’s ‘Stillness ~ Silence ~ Spaciousness’, we can begin to lose balance, harmony, peace and well being in our life; we are susceptible to more stress, distress, angst, and illness. A mindful-awareness practised and cultivated as Meditation, enables us to sustain greater ‘Stillness ~ Silence ~ Spaciousness’ as a resource for greater personal health, professional performance and actualisation of our full human potential.